This guest post is by Sarah Gilbert, a Portland writer and blogger. She’s also the mom whose story of being turned away from a local burger joint with her three young kids led to the chain retooling their drive-thru policy and signage to actively welcome people on bikes. Even in dreamy Portland, carfree parenting isn’t always a piece of cake, as Gilbert keeps discovering and, lucky for us, exposing in her writing, including here. TriMet, Portland’s public transportation agency, has leaked plans to raise its fares from $2.10 to $2.50, and to eliminate its transfer system in which a single fare is good for an hour and a half, often enough time for a quick errand. 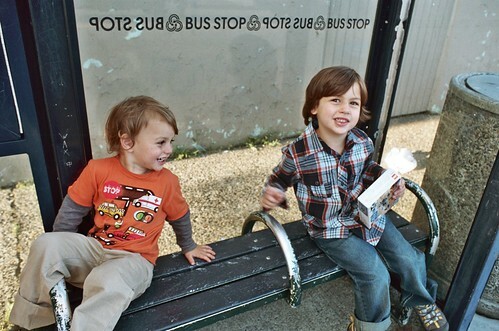 The proposed fare policy would force families with young children off the bus entirely. Most would go back to the car for errands and other short trips. The bus aisles will be clear of strollers. But the streets will be clogged with cars. Already, it’s not cheap to travel with one or more grade school-aged children. My nine-year-old is $1.50 per trip, and my six-year-old is about to turn seven and enter the fare system. This means that under the current fare system we would still be able to travel together, round trip, for $5.10 total It’s not cheap, but it’s about half the price of an hour of Zipcar and more convenient than biking for long distances in the rain or, especially, after dark, when I prefer not to have my children sharing streets with often-inebriated drivers. I have no car, so the decision is easy — pay for the bus, or bike or walk for free. We’ve walked more than a mile one way before, to avoid paying a fare when our transfers expired. Luckily, we’re all very mobile and we have sturdy alternate transport options. Most of the Portland metro area’s transit-dependent families don’t have a decision matrix that looks anything like mine. Their choices are often bus or car, and that car is likely unreliable, a beater, or a loaner. It might not be insured and it probably isn’t a hybrid. The families I know who ride transit during the day are mothers without jobs doing errands with their children; either their family has no car or only one or they believe in making low-impact choices. Like us, they do not ride transit every day. They ride to the big, cheap grocery stores on the edges of the city. They ride to the doctor’s office. They ride to and from school; many parents I know ride with their older kids to school, drop them off, and then ride back home with the toddlers and preschool-aged kids. They ride to the indoor play park or the thrift shop or the hospital. When I was pregnant with my third child, I spent a lot of time riding to Emanuel Hospital, where the stops would be crowded with other pregnant moms and parents and their babies and young children. This policy is a firm message from TriMet: We don’t want you, families. We far prefer commuters — who already go only one-way and can pay more, who are choosing the bus for convenience and downtown parking prices, not because it is the only option — and the elderly, whose discounted fares won’t increase and who, TriMet’s spokesperson says, tend to travel farther. A day-long ticket for these travelers would only be $2. The most telling example of how much TriMet doesn’t want families is the fare options: There is no all-day youth ticket. My family, traveling the mile-and-a-half to Hawthorne on the 75, would pay $11.40 there and back once my middle child’s birthday arrives in April; a luxury I would rarely afford. For nearly every other family like mine, the there-and-back errand would be insensible. They would choose the car. I filled out TriMet’s fare increase survey a few months ago, and was discouraged that I saw none of the choices included an option that made sense for my family or families like mine. Why not decrease the fares for kids and prompt more families to make the choice to do errands by bus? Why not make the all-day fare for children comparable to the “honored citizen” fare? Why not make choices that demonstrate a prioritization of the least deep-pocketed transit users over the most? Many of the bus drivers are wonderful and sweet to my children; many other riders, too, light up with smiles and stories when we come aboard. My children love to sit in the way-back of the bus, where the teenagers and the surliest of the bus riders usually sit. Rarely do I see those bubbly boys fail to coax a smile out of at least one of the frowny-faced riders. Often I am surprised at how welcome we feel. Always I am glad to give my children the opportunity to interact with adults of all sorts. Sadly, TriMet’s leadership does not share this welcome, and would rather have me interact only with my own kind (other families in minivans and Volvos, I suppose). At no time have I ever felt this more keenly than I do now. If this fare increase is passed, we will be riding our bikes in all but the most desperate times. I cannot afford $11 or $12 for a casual errand. And this will impact my decision about where to send the younger boys to school ($8.30 is too much to pay to drop two children off at school and turn around and go right back home). The rest of the families will be in cars, right where TriMet apparently prefers them. This post is by Sarah Gilbert — look for more guest posts on Taking the Lane soon!